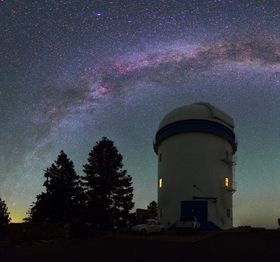 The Sierra de San Pedro Mártir Observatory is part of the National Astronomical Observatory that is in turn operated by the National Autonomous University of Mexico. The history of the National Astronomical Observatory goes back to the 19th century when its first telescope was placed on the balcony of Chapultepec Castle, Mexico City. Over the centuries, this modest start gradually led to the facilities that exist today at the Sierra de San Pedro Mártir Observatory. The three telescopes in Sierra de San Pedro Mártir came into existence once the previous location from Tonantzintla, Puebla became too polluted for astronomical studies. The first 0.84 m (33 in) telescope was built at the end of the 60s, and it was followed by a second 1.52 m (60 in) telescope in 1970. The 2.12 m (83 in) telescope was installed between 1974 and 1979, and it is today the largest optical telescope in Mexico. Apart from the three telescopes, the observatory facilities include a library, computer room, recreation areas, and cabins for staff and visiting astronomers. The location was perfect for the new observatory mainly due to the high altitude (9,280 ft), clear skies, low humidity, low light pollution, and virtually no radio interference. These characteristics transformed the Sierra de San Pedro Mártir Observatory into one of the best places for astronomical research in the world. The staff working at the observatory is preoccupied not only with scrutinizing the universe, but also with protecting the whole national park. The National Autonomous University of Mexico is currently sharing the management of the park with SEMARNAT and the State of Baja California. This way, the activity of the observatory is an integral part to any project aimed at safeguarding the park. The Sierra de San Pedro Mártir Observatory is open not only to scientists, but also to the general public. The entrance is free, but each visitor will have to take some precautions before embarking on the journey. Visitors will have to pay a fee before entering the Sierra de San Pedro Mártir National Park, but the money does not go to the observatory. The observatory is located at high altitude, so people in poor health will not be allowed to visit. The trip to the closest hospital requires a two-hour drive. The observatory is located in a secluded area, so visitors should have enough gas, food, and drinks for their stay. The closest gas station is 60 miles away from the observatory. The observatory does not offer accommodation except for astronomers and relatives of the staff. There are accommodation options inside the national park. People can come on visit every day of the week from 10:00 AM to 1:00 PM and from 2:00 PM to 3:00 PM. The observatory does not accept visits during the last two weeks of December and the first week of January. Any visit should be announced a couple of days in advance via phone number (52)-(646)-174.45.80 ext. 311 or 312. The same number, ext. 302 is available for those who would like to organize a guided visit. Drive south 140 km. from Ensenada on Transpeninsular Highway. Once you pass San Telmo de Abajo, there will be a big sign reading "Parque Nacional Sierra De San Pedro Mártir". Drive east for 48 miles and you will reach the entrance of the national park. The total driving time from Ensenada to the observatory takes around 4.5 hours. For tour date email bajagoodlifeclub@gmail.com.